Compiling MKVToolNix can take quite a bit of time. It’s a C++ application, it uses a lot of template code, and it doesn’t make use of the pimpl idiom as much as it could. For years I’ve been using the usual several techniques trying to keep the time down: parallel compilation and pre-compiled headers. However, it still takes quite a lot of time, and that’s a bother during development. That’s why I was instantly stoked when reading about an announcement earlier this weak: zapcc, a clang-based C/C++ compiler heavily tuned towards performance, is being open-sourced. Having more Open Source options in the compiler world is great, having someone working on speed is even better. Now those numbers explore the whole range between “no help at all” (no pre-compiled headers, no parallelism during compilation, slowest compiler) and “bells and whistles” (maximum parallelism, fastest compiler). A realistic comparison is between my usual setup and the fastest zapcc variant. 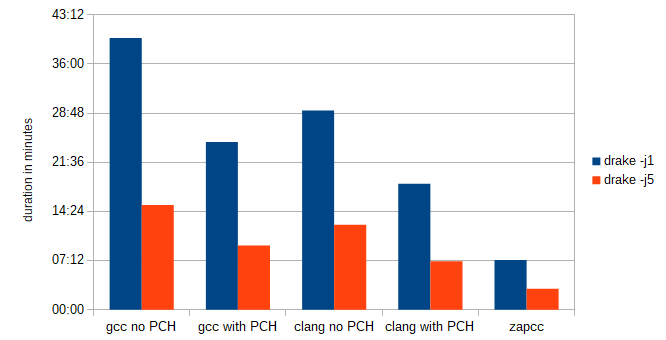 Those two numbers are the bold ones above: clang using pre-compiled headers with five running compilers in parallel vs. zapcc with five running compilers in parallel. And this is quite remarkable: from seven minutes down to three, down to 43% of the original time. Yes, this does make quite a difference during development. So if you’re looking for a way to speed up your C++ compilation time, take a look at zapcc. I’m just glad people focus on different aspects of compilers, and us users can profit from them thanks to the compilers being Open Source. A big thanks to all compiler developers! This entry was posted in Programming and tagged compilers, MKVToolNix on June 23, 2018 by mosu. I’ve released v5.6.0. It fixes a couple of important issues with the new --split parts: functionality. Other bugs were fixed as well. A Polish translation of the programs has been added as well as a Spanish translation of mmg’s guide. documentation: Added Spanish translation of mmg’s guide by Israel Lucas Torrijos (see AUTHORS). mkvmerge: bug fix: SRT subtitle entries with colons as the decimal separator are accepted. Fix for issue 754.
mkvmerge: bug fix: XML tag files with <Simple> tags that only contained a name and nested <Simple> were wrongfully rejected as invalid. Fixes issue 752.
mkvmerge: enhancement: mkvmerge was optimizied to keep cluster timecodes strictly increasing in most situations. all: Added a translation to Polish by Daniel (see AUTHORS). mkvextract: bug fix: Extraction of AVC/h.264 was completely broken after 2012-04-09 resulting in files with a length of 0 bytes. mmg: new feature: When adding a Matroska file that has either the "previous segment UID" or the "next segment UID" set then mmg will copy those two and the source file’s segment UID into the corresponding controls on the "globla" tab if they haven’t been set before. Implements ticket 733.
mkvmerge: new feature: The verbose identification mode for Matroska files will now includes the "segment UID", the "next segment UID" and "previous segment UID" elements. mkvmerge: enhancement: In "–split parts:" mode mkvmerge will use the output file name as it is instead of adding a running number to it if all the ranges to be kept are to be written into a single output file. Implements ticket 743.
mkvextract: bug fix: mkvextract will no longer abort extracing h.264 tracks if it encounters a NAL smaller than its size field. Instead it will warn about it and drop the NAL. mkvmerge: bug fix: Writing more than two parts into the same file with "–split parts:" resulted in the timecodes of the third and all following parts to be wrong. Fixes ticket 740.
mkvmerge: bug fix: The "–split parts:" functionality was not taking dropped ranges into account when calculating the segment duration for files that more than one range was written to. Fixes ticket 738.
mkvmerge: bug fix: The "–split parts:" functionality was producing a small gap between the first part’s last packet’s timecode and the second part’s first packet’s timecode if two parts are written to the same file. Fixes ticket 742.
mkvmerge: bug fix: The "–split parts:" functionality was writing a superfluous and empty first part if the first range starts at 00:00:00. Fixes ticket 737.
mmg, build system: Fixed building with wxWidgets 2.9.3. This entry was posted in Matroska, Programming and tagged Matroska, MKVToolNix on May 27, 2012 by mosu.